This is the time of corporate takeover in America. The mind control apparatus is in full swing. Network news, cowering before big business, minimizes or ignores anything that might provoke or legitimize dissent. Clear Channel, the monolithic owner of radio stations and controller of playlists spews forth its dictatorial litany of Brittany and a slew of wannabees along with classic rock and nothin' but the oldies. Well the occasional Coldplay spin is bearable. Still, a pervasive complacency wafts in on classic pop riffs as we drift through the drustore aisles or wait on hold for the service rep to solve our problem with our latest purchase/software glitch..
Why. do. birds. sud-den-ly ap-pear ev-ry time you are near? Well, if they're seagulls it's the smell of low tide and a decaying environment. And Karen, couldn't you at least have had a salad once in a while? If a corporatized, consumerized mindset threatens to obliterate rational thought, and while we're at it, democracy, the only chance we have is with a groundswell of grass roots movements. Moveon.org has shown what can be done in the political sphere. What are the alternatives in the the world of music? Bringing the sound of original thought to the ears of a numbed populace is a daunting proposition. At the grass roots level, we have our open mics at clubs, church coffeehouses and house concerts. Into this breach another tool has been thrust: the artists' collective. While not entirely new, the embodiment of this idea seems to have reached a remarkable level in the crew known as Tribes Hill. The story of Tribes Hill begins with its central coordinator, Frederick "Rick" Rock. Looking back into his history, he seems particularly qualified to spearhead the coming together of a large group of artists into a cohesive unit. Rick grew up in Florida, where his main interests were art and film. The impression one gets, even today, is that he is an organic free thinker. He says: "I wanted to be a painter, a film maker. I played guitar and used to hang out with friends on the beach. I was involved with a couple of collectives that never really took off. While I was in college, I started one in Florida that was based on showing independent films. I did that for a season [a couple of months]. I lived a unique lifestyle back in Florida, had a lot of adopted friends and worked on a lot of different projects. I had this place, it used to be an old bar, that I refurbished. There were a bunch of people, sort of like a commune. Back then, you could take films out of the libraries, for free. I had a 16mm projector, so it didn't cost anything for the films. The rent back then, was $85 per month for this place. And you could go across the street and there was the ocean. Low overhead was common back then, and people would just do the pot luck thing. [to get together with people, and show films] That was one of the first things I did." Hammond House, the locus of Tribes Hill, is located on Grasslands Rd. (Rte.100-C) in Westchester County, between the Sprain and Sawmill Parkways. The web site states: "One of the earliest surviving colonial farm houses in Westchester County, Hammond House was built in 1719 by Capt. William Hammond a younger son of William, Colonel James Hammond, commanded the Westchester Militia during the Revolution. He has been described by some local historians as 'a sort of Westchester Paul Revere,' riding off from the house to alert his troops. Legend has it that Washington visited the house for a conference with the Colonel probably in the summer of 1780, with only two or three aides and left a few minutes before the house was surrounded by Tory troops. Hammond was taken prisoner and held on a prison boat in the Hudson until he was released about one and a half years later." In 1995, Rick and his brother had plans to combine a place to live with a collective. He states: "My brother and I were involved with renovating a school house in Yonkers. We were hoping it was going to be an artists' collective -- visual arts, film, and music. It was a big space. Then the landlord decided he wanted to go into low-income housing, so we found ourselves without a house. That's when we discovered Hammond House. My brother was driving by and saw the house and it was in disarray. The grass was three feet high. I inquired about it and discovered it was scheduled to be torn down. I did some research and found out that it was a really important house, dating back to 1719 and that George Washington was almost captured there. My brother and I said, "Well, we're going to try and save it." And that was a job in itself because it sits on city watershed property. So we bought the structure [with the idea that it would have to be moved]. We were told when we bought it that we'd have to fill in the hole. After we bought it, I found out that it was on the National Register [Historical Landmark Status]. I got together with the National Registry and we protected the property. We negotiated with the DEP and were allowed to keep the house here. It had held landmark status beforehand, but had been turned into a laboratory. It was a Lime Disease research center, part of New York Medical College. What I didn't know at the time was that they had gotten into a serious disagreement with DEP who delivered an ultimatum to remove the house. They operated it as a research center up to a year before we got it. When we came in, it was filled with laboratory equipment. It was a real mess. You wouldn't have recognized it. They couldn't protect it under the guidelines of the National Registry because they hadn't been preserving the property. After successfully fending off the DEP, Rick inadvertently began the next chapter of Hammond House. In 1998, he went to an open mic. He remembers: "I stumbled upon Gandalf Murphy, doing an open mic. I just went to listen. They played three songs. I was impressed and said, "What do we have to do to have you do a whole show?" I think they were just forming at the time and they had a little sampler CD. So we did a Halloween party. It was Gandalf Murphy's first full show as Gandalf Murphy and the Slambovian Circus of Dreams at Hammond House in '98. So we built a little stage in the back. Without any publicity or anything it was the wildest Halloween party. There were people coming in truckloads. There was something magical about the music that they were playing. It was communicating a new message. One of spirituality, of camaraderie. The types of people they were bringing out lent itself to the beginnings of Tribes Hill. The following year, we started doing hootenannies at Hammond House. July 4th we had Gandalf Murphy on again and then we had musical get-togethers on Sundays. The next year I did a couple of other shows with Gandalf and brought in some more musicians in. I think Mark Von Em came in at that time, and some of the other earlier Tribe members. And then in 2001, I met Terre Roche. I was thinking, "Maybe now I'll turn it into something else. Maybe I'll do house concerts. I quizzed Terre Roche about it. She said, "That's a great idea!" I said "If I do these house concerts will you play?" She said, "Yeah, Of course." In 2001, I did a series of house concerts (8 shows). I had The Roches, the Kennedys, Groovelily, Jack Hardy with members of his songwriting group, Amy Fradon and Terence Martin (a benefit, right after 9/11), KJ Denhert, Rhonda Schuster, and Mark Von Em. I ended it with a special show at my church with Jane Siberry. That was Hammond House Concerts. I was paying all the musicians, I wasn't making any money, I was losing money. At the time I was doing something to help promote this music. It was all new to me. I thought, "Man, this is a lot of work!" As a venue, I didn't think it was really helping these guys. OK, so I put on these shows and I put out a lot of sweat, but what are really ultimately doing?" creating committees, so it doesn't all fall on me. We're bringing in other people that are non-musicians. Amanda Bach does the web sites and manning the booths, selling the cds. It's not just a collective of singer/songwriters, it's a community of artists and patrons." Tribes Hill has become a non-profit organization, inder the umbrella of the National Folk Alliance. Rick summarizes the group's activities: "The first year, we had our initial meeting in the summer, and a couple of months later, we had our first compilation CD. Now we do two shows at Hammond House, we do a special interfaith holiday show -- a solstice show. That's a lot of artists working together, on traditional, and original material. Then, as a group, we attend and present music at Falcon Ridge (post-concert campfire) and The Northeast Folk Alliance (NERFA)Conference in guerilla and semi-formal showcases. When I started Tribes Hill I was aware of a number of quality artists trying to make a go of it. I realized that being an artist often requires one to live outside of the comfort of normalcy. It can be a struggle. Those moments on the stage are temporal and fleeing. The challenge comes from trying to create a meaningful and supportive lifestyle. Tribes Hill helps artists connect with others. There are things that we do as a group that would be difficult, if not impossible, to do as an independent singer-songwriter." Rick states: " One of the reasons I'm doing Tribes Hill is because I'm disgusted by commercial radio. You know, Natalie Merchant was dropped by Elektra Records because she only sold half a million copies of her 2001 CD, Motherland. You've got a crisis right now in the media. They want to make more money. People are finding new ways to get music. They're not getting it the traditional ways, going into a store, new releases being played on the radio on a regular basis, Remember back in the 60's and 70's? You'd just listen to the radio and you'd hear the new Beatles songs and the Stones. It'd be on the radio! You'd have the top 40. You know? Now, it's not working. Now they play all the golden oldies. I just hear it everywhere. How long have we been listening to this same 60's, 70's, 80's stuff? How long? When there's really good music being created and performed out there. People in numbers are power. We have to come back to patronizing Mom-and-Pop kinds of places. Owner-run restaurants, owner-run bookstores and music stores, stuff like that. Make that choice when you're able to. The next thing Tribes Hill wants to do is get involved with distribution. My idea with distribution would be regional distribution, having a special rack at various stores. Some of them might be bigger chains like Borders. As corporations go, I take my hat off to them, for the amount of support they have given to independents. We could get some cooperation with them. But then also to market at some privately owned stores. Most people are unaware that this music exists. If people were given the means to hear this music, they'd love it. When people hear this music for the first time, they say, why am I not hearing this? If we can get this music out there and people could give it a listen, we could create a bigger audience. I constantly get people who stumble across this music, they come out to a Tribes Hill show and they're blown away! 'Wow! I didn't know this existed! These people are great!' So that's the next phase, but that's an ambitious one because it's going to require a lot of people to make it work. The good thing is that there's more sales going on on the internet every day. It's more of an underground movement and this certainly works with that. "When I first started to venture into New York State, I remember reading an article in a Westchester paper about concerts at a historical house. Hungry for gigs, I called the number and talked to Rick Rock for a while. He said something like, "Well, we're trying to help local artists, but send your CD anyway, kid." Rick has since given my CDs great reviews in the Tribes Hill newsletter, hosted me for a house concert, and introduced me to some of the most creative people in New York. At the Falcon Ridge Folk Festival, I've always been impressed by the level of talent and the friendly warmth of the Tribes Hill tent. Rick Rock is there, pouring wine, playing songs, and nonchalantly creating the most important alliance of folk music to happen since Fast Folk. The Fast Folk recordings now belong to the Smithsonian, a brilliant example of our American folk music heritage. Expect Tribes Hill to have the same kind of impact." "What has impressed me most about Tribes Hill is the way that its members are committed to benefiting humanity by promoting the voice of artists. In doing so, Tribes Hill is a vibrant, supportive community. In a graceful, understated yet powerful way, it carries out its mission. Without question, our festival this August was stronger because of the Tribes Hill presence. It's a model for how all of the music community should be. We look forward to being a part of Tribes Hill for many years to come, sharing in its journey to benefit and enlighten folks through music. For me, the potency of Tribes Hill doesn't yet lie in the size of its audience, which is still modest. It lies in the incredibly fertile artistic environment that these artists have created, under Rick's guidance. The more people collaborate and cooperate, the more everyone advances creatively, and that's what is putting Tribes Hill on the map -- the high quality of its artists. I feel like I belong to a community in what can be a lonely business otherwise. I struggle to balance time to be with my friends from Tribes Hill and attend their concerts when I'm not on the bill and to make it to meetings. I never feel judged when I haven't been around and feel welcomed when I can be. That kind of support is rare and therefore beautiful to me. We are building a COMMUNITY around this music. People come and have an experience at a Tribes Hill event. It is more than people listening to some live music. People get to be a part of something magical and spiritual, they meet the artists and each other and really make personal connections. They also get to hang out with people of all ages a rare thing in our society. I got involved in the organization at a time when I desperately needed to be involved in something bigger than myself and I've found true friends here. I have been healed by the music these people make. 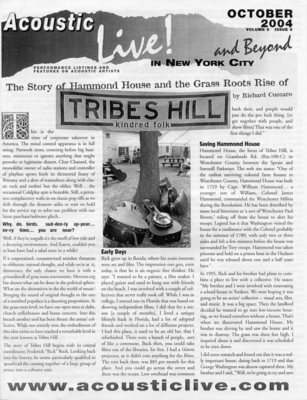 Tribes Hill is the catalyst of a whole new Hudson Valley music scene and it is one where the artists truly are united... I never thought it was possible. Can a collective like Tribes Hill change the way America discovers and listens to music? Certainly not alone. The task of challenging the corporate machine would be daunting for any grass roots establishment. We all need to "get behind the plow," as an old folk song exhorts. As member Katherine Pritchard, states, when asked about the collective's potential impact upon the listening audience, "I think it has had an effect on both listening and performing populations. It often takes a load off the performers - meaning they can just sit back and do their thing without thinking too much about imminent career moves - and brings in audience members in closer to the performers - I think they feel more a part of what's going on, that the performers are more accessible to them, because they are." And that may be the most powerful element of all.